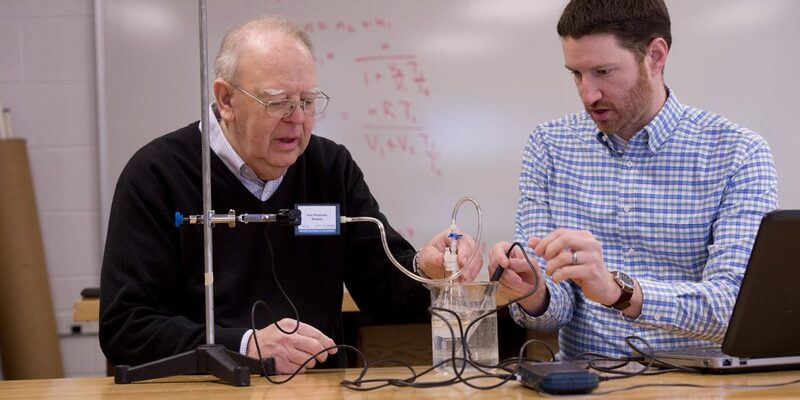 Hesston College physics professor Joel Krehbiel and physics professor emeritus, Nelson Kilmer, aren’t satisfied to just look past answers that don’t quite hit the mark. With a shared curiosity for accuracy, and a relationship built on respect of the work each does and has done with students, the educators collaborated on two articles, with student collaboration on one, that were published in the January 2019 issue of The Physics Teacher journal. It started during Krehbiel’s first year of teaching in fall 2015. “Nelson was really helpful during my first year of teaching and willing to assist, so he often attended labs to help out,” said Krehbiel. Students were conducting a lab to help them understand the relationship between pressure and temperature in a fixed-volume container. The relationship, known as Guy-Lussac’s Law, says that pressure and temperature increase proportionally. After measuring the pressure in flasks placed in water baths of different temperatures, students plot their data and extrapolate back to zero pressure to estimate absolute zero. Kilmer had helped students conduct the same experiment countless times before retiring in 2014 after 46 years at Hesston College. He noticed that the estimates for absolute zero were off by almost 15 percent and he was curious to what might be going on. For the second article, students Kenton Schroeder (Harper, Kan.) and Harune Suzuki (Osaka, Japan) in last spring’s STEM Projects class tested an idea put forth by Kilmer as a new way to find the density of salts using simple lab equipment. The article offers a new way to find the density of complex crystalized material which also dissolves in water, such as salt, using simple lab equipment. Learning experiences that go beyond lectures and note taking and dive into practical application and experimentation are critical to the foundational, experiential learning environment Hesston College strives to give students early in their collegiate career and across all academic disciplines.